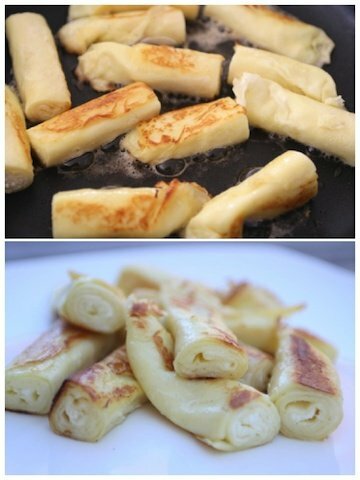 Nalisniki (налесники) also known as cheese blintzes, cheese crepes and blinchiki are a well-known dessert in the Slavic culture. These thin crepes are made from a silky batter and are then stuffed with a sweet cheese filling. I love how delicate, delicious and golden-yellow in color these turn out to be. This has been a favored recipe passed down by my mom and tested many of times. If you prefer to use less eggs or don’t have as many on hand check out my other nalisniki recipe. Tip 1: For a lump free batter alternate the liquid ingredients with the dry when mixing, instead of dumping everything together. Tip 2: For best results keep your heat temperature at a low level. You know your crepes are ready to be flipped once the edges start to crisp up slightly. Keep in mind these will bake later so you don’t need to keep them on the skillet too long. Note: These are freezer friendly. If you want to make these in advance and freeze, just do so after you layered the nalisniki with butter. Be sure to cover nalisniki in an airtight container or try to avoid any poor coverage as that can result in frost. 1.) Crack 10 eggs into a large bowl; add half of the flour and whisk until thick. Add the remaining flour and keep whisking. Slowly add the milk, then add the sugar, salt and oil; continue whisking until silky. 2.) Heat a medium-sized non-stick skillet (about 9″ in diameter) over low-med heat. 3.) Drizzle about half a teaspoon of oil onto preheated skillet; swirl to coat. 4.) Using a 1/3 cup measuring tool fill batter almost up to the rim; pour into skillet and quickly swirl to evenly coat the pan. 5.) Once edges start to crisp up a little run spatula down the sides and carefully flip the crepe. Hold in skillet for about 20 seconds and remove. Repeat with remaining batter and transfer done crepes unto a glass plate. 6.) Crepes should be delicate and slightly thin. Combine the room temperature cream cheese, farmer’s cheese, sugar and cottage cheese. Beat until creamy. 1. Preheat the oven to 350 degrees F. Grease a 13″ by 9″ Pyrex glass dish with butter; set aside. 2. Place crepe onto a flat surface and spread 1 heaping tbsp of the cheese filling evenly over the crepe. 3. Starting from the lower bottom slowly roll the crepe upwards. 4. Place ready crepes into the buttered Pyrex dish and continue filling and rolling the remaining crepes. 5. Before overlapping any crepes, be sure to cover the crepes with some butter pieces. Thinly slice 1 stick of cold butter and spread out half of the slices over the rolled crepes. And the remaining half over the second layer. You should have about two layers. 7. Serve with sour cream and enjoy! Note: To reheat crepes; melt a few tbsp of butter (about 2 tbsp) in a medium-sized skillet over medium-low heat. Fry crepes on each side until golden. YO MAKE CREPES: Crack 10 eggs into a large bowl; add half of the flour and whisk until thick. Add the remaining flour and keep whisking. Slowly add the milk, then add the sugar, salt and oil; continue whisking until silky. Heat a medium-sized non-stick skillet (about 9" in diameter) over low-med heat. Drizzle about half a teaspoon of oil onto preheated skillet; swirl to coat. Using a 1/3 cup measuring tool fill batter almost up to the rim; pour into skillet and quickly swirl to evenly coat the pan. Once edges start to crisp up a little run spatula down the sides and carefully flip the crepe. Hold in skillet for about 20 seconds and remove. Repeat with remaining batter and transfer done crepes unto a glass plate. TO MAKE FILLING: Combine the room temperature cream cheese, farmer's cheese, sugar and cottage cheese. Beat until creamy. TO ASSEMBLE CREPES: Preheat the oven to 350 degrees F. Grease a 13" by 9" Pyrex glass dish with butter; set aside. Place crepe onto a flat surface and spread 1 heaping tbsp of the cheese filling evenly over the crepe. Starting from the lower bottom slowly roll the crepe upwards. Place ready crepes into the buttered Pyrex dish and continue filling and rolling the remaining crepes. Serve with sour cream and enjoy! TO REHEAT CREPES; melt a few tbsp of butter in a medium-sized skillet over medium-low heat. Fry crepes on each side until golden. Hi, I would like to make these. The more eggs the more crepes? Would it be possible just to make smaller crepes from smaller pan and then bake it without having to cut up up afterwards? 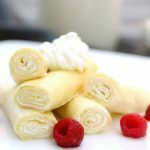 Hi Olga, I do seem to get more crepes out of this recipe than another, but I like these quite thin so it may vary in quantity depending on how much crepe batter you ladle in. This batter is thin to work with so it should not be difficult. You can certainly try a smaller pan but that may take up more time so use two. I have tried many recepies before this one and they were ok but not great these nalesniki were truly fluffy this is a keeper thank you for sharing. Made this recipe, it it is beyond my expectation, thanks a lot!!! I have put a batch in freezer, do I have to defrost it first, or I can put it straight into the oven??? Nataly, Thank you for the kind feedback! You can place the frozen nalisniki right into the oven, however the baking time will vary. If you were to bake them thawed the baking time usually takes up to 25 minutes. If baking frozen they can take anywhere from apprx 30-45 min, however do check on them for doneness as the bottom layer can brown.